Recipe quoted from "Pak-Rajeswar O Banjon Ratnakar"
Whatever you say is never enough for this magic herbs. The plant having the carminative property of relieving gas. In India it is also traditionally given to mothers immediately after childbirth. In India, dill is known as shepu in Marathi and Konkani, savaa in Hindi or soa in Punjabi. In Telugu, it is called Soa-kura (for herb greens). It is also called sabbasige soppu in Kannada. In Tamil it is known as sada kuppi. In Malayalam, it is chathakuppa) sathakuppa. In Sanskrit, this herb is called shatapushpa. In Gujarati, it is known as suva. It is considered to have very good antigas properties, so it is used as mukhwas, or an after-meal digestive. In Manipur, dill, locally known as pakhon, is an essential ingredient of chagem pomba – a traditional Manipuri dish made with fermented soybean and rice. 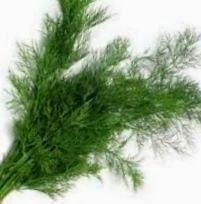 In Hoodoo Folk Magic DILL LEAF is said to be valuable for Breaking Jinxes or Crossed Conditions in a person's Love Affairs. Some people mix DILL LEAVES with Salt and scatter the mixture throughout their home to counteract rootwork that this been laid down in the corners of their rooms by enemies who sprinkle evil Powders or Dusts. Boil the leaves and strain the water. Take the leaves, add chickpea flour, flour, water of ginger paste, salt and 1/2 tsp of garam masala. Make a tight dough for flat bread. Keep rest for 10 minutes to set the dough. Make thin flat breads about 2 inch diameter circle. In a deep pan boil some water and cover the pan with a cheese cloth. Put the breads over the cloth and cover with a lid. Cook for 10 minutes or until cook properly. In a bowl take the yogurt and mix rest of the garam masala, make the small peices from those bread and mix with the yogurt and serve.